So, for tea tonight we’re having a Monday night treat. It’s cold outside, it’s the first day back at work after the weekend and so we all deserve something a little bit special. I’ve decided on a beautiful, warming and just a touch naughty dish. This dish could easily be bulked up with mushrooms, peas, spinach or more carbs to serve six or so people, but this version will provide large portions for 2 people, with plenty left over for lunch tomorrow. I served mine with a nice portion of crispy frites, but it would just as well with mashed potato, plain boiled rice or even tagliatelle. For lunch tomorrow, we’ll have the meatballs and sauce with some bread to dip. 600g mince – beef, pork or lamb (or a mixture) would be great, but I went for lamb. 1. Put the mince, breadcrumbs, half of the chopped parsley, half of the dill, the egg, and the allspice into a bowl along with a good pinch of salt and pepper. Get your hands in there and give it a good mix together, making sure it’s fully combined. 2. Next, roll the mixture into small balls – this amount will make about 20-25. 3. Put a large pan on a medium-high heat and add a glug of olive oil. Once heated, add the meatballs. 4. Cook for approximately 10 minutes, turning often, until they are browned and slightly caramelised on all sides, then transfer to a plate. 5. Chop your onion into as small pieces as you can manage, and tip into the pan with the meatball juices. Cook for 2 minutes, then add a few drops of lemon juice and a splash of sherry (a very small glass’ worth). 6. Allow to bubble for a few seconds, then stir in the flour. You will need to keep stirring to make sure that lumps don’t develop. When it’s all combined, start adding the stock gradually, stirring all of the time. 7. Once all of the stock has been added, tip in the cream and stir. Cook, stirring all of the time, until the sauce has a nice thick consistency. Finally, tip in the remaining herbs and season to taste, adding more lemon juice if necessary. 8. 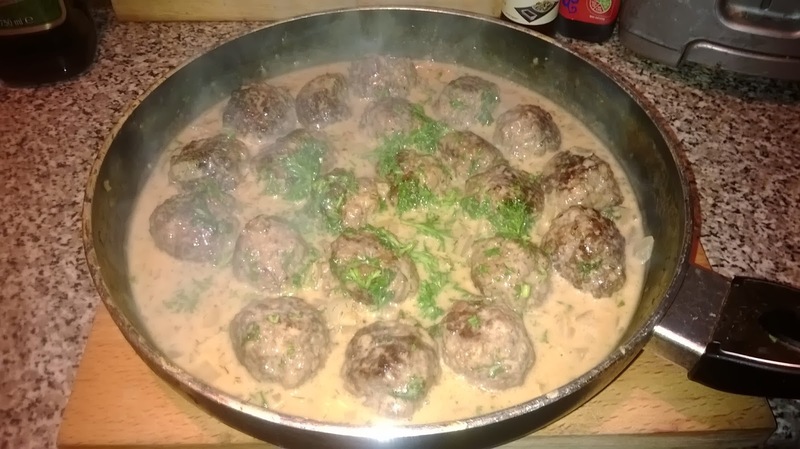 Add the meatballs back into the pan and heat for a few minutes, then it’s ready to serve in big deep bowls with your chosen side. Next Article Pancakes, of course!